For more on blockchain in China, click here. Blockchain technologies are most commonly associated with the financial sector, and for obvious reasons. Its origin as the decentralized ledger for the cryptocurrency bitcoin established a clear link between the system and its financial applications, which for better or for worse has driven the general public's understanding of this record-keeping tool. 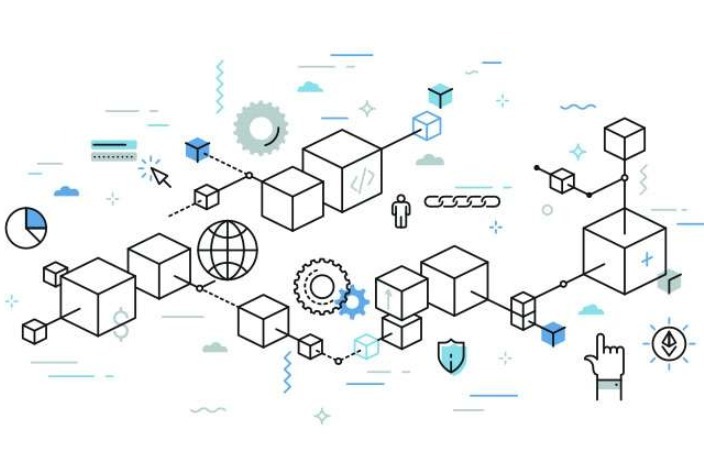 But developers have also been coming up with new and expansive ways of implementing blockchain that have the potential to revolutionize entire industries, ranging from the protection of intellectual property to immigration and aviation. China's track record for protecting intellectual property is far from spotless. While the country's legislation is on par with that of the international community, enforcing the rules has proven to be a more difficult task. Under China's official copyright law, foreigners' and Chinese nationals' ownership over creative works are protected within the country's borders. Unauthorized reproductions or use of an artist's work is a violation of Chinese law and can result in a lawsuit. "On paper, China has met international standards for years, but it's not always easy to enforce," says May Lu, a former partner at Shanghai-based Regulatory and Compliance firm MWE China Law Offices. Litigation is mainly confined to local courts, she adds, and doesn't progress to higher levels, resulting in a lack of known precedent through the Supreme People's Court, and variation on the provincial level. Because of this, courts do not have a standardized framework on which to base decisions when issuing verdicts about copyright. While judges in China still struggle to accurately and consistently parse these legal intricacies, blockchain could offer several potential solutions. China-based tech firm Onchain is currently working on developing a token system that would make it easier for independent musicians to protect their IP. Partnering with a Chinese user-generated content platform (think Soundcloud or Bandcamp), musicians on the website will be able to issue tokens to consumers, enabling them to easily keep track of who has permission to play and use their music. "When you have ownership over the token, you can list it on the IP market, not just on a single-use basis, but you can make it available to those who want to use your music, like a movie company, or I can rent it to you for an event, for example," Senior Blockchain Solutions Specialist Will Liu tells us. Coupled with subtle checkpoints embedded in the songs and dedicated technologies developed to detect these identifiers, they've created a clear-cut system that makes it easy to report those that haven't obtained the proper licenses. "With our network, if you have a token that contains enough information to describe the content, we can connect with the online courts and submit the evidence. It's easy, and helps creators to defend their rights more efficiently without having to go to the courts in person," Liu continues. More information, more cases filed, and more protocol all means more protection. "If it's a clear case and the evidence is solid then the whole process is just streamlined," he concludes. And with verifiable records and secure transactions, there's more than enough information to protect and support content creators. Onchain acts as the parent company for their nonprofit, public blockchain platform by the name of Ontology — meaning the philosophical study of being. Among the many projects Ontology is looking to get involved with is the UN-backed digital identification initiative ID2020. "They're working toward some really interesting things like giving refugees who've had to leave their homes means of identification," Ontology's Senior Marketing Associate Daniel Assab tells me. "For those that have lost their IDs and papers, this system gives them proof of land titles and country of residence among other things, helping to rebuild their identity with blockchain so that they have something tamper proof they can use to cross borders." There are a number of ways that blockchain can be used, and is currently being used, to aid in the growing global refugee crisis. In some camps, token systems have been implemented to eliminate the need for physical currencies, enabling resources to be acquired and distributed in an easily traceable and controlled way. As of 2017, blockchain is also being used to help asylum seekers integrate in Finland through the use of blockchain debit cards, effectively replacing a bank account, linking financial transactions to individuals and ensuring a certain amount of financial security for newcomers. "Now that the hype is over, we're in the midst of a really nice period where there are only people interested in the technology and what we can really do with it, meaning we can start focusing on some of the goals that the ledger was written to accomplish"
Along the lines of digitized national identity, using blockchain to collect and share medical records enables refugees to provide healthcare providers with important information about their family and personal histories. What Ontology does in creating high-performance public ledgers is part of what enables these kinds of systems to exist, building frameworks that support chain networks for other developers to plug into, so to speak. After the cryptocurrency bubble burst, organizations focusing on the effective and productive use of blockchain are finding it easier to connect on an international level to address problems on a global scale. "In 2017, there was a lot of interest in the industry but mainly for short-term speculation and investment," Assab says. "Now that the hype is over, we're in the midst of a really nice period where there are only people interested in the technology and what we can really do with it, meaning we can start focusing on some of the goals that the ledger was written to accomplish." Based in Hong Kong and Bangkok, Block Aero has applied the same idea to aviation in an industry consortium network that connects airlines, leasing companies, maintenance service providers, manufacturers and regulators. Historically, documentation of aircraft maintenance and repair has been dominated by paper, making records susceptible to loss and alteration. Last month's Boeing 737 Max 8 crash on Ethiopian Airlines highlighted the risks posed by such a process. Engineers from the Federal Aviation Administration (FAA) have even gone on record to say there wasn't a complete review of the documentation, and the Seattle Times has cited flaws and oversight in the initial reports handed over from Boeing to the FAA. While the industry itself has some of the highest international safety standards, the paper-based model leaves those in the supply chain vulnerable. "Blockchain gives a new way for government regulators to oversee and establish industry-wide safety standards, which are especially important when there are such high stakes," Block Aero founder Todd Siena tells me. "The paper-based nature of flight and maintenance records is inefficient, and when it comes to collaborating on aviation assets and data sharing, it's cumbersome and time-consuming." After 10 years of working with members in the airplane manufacturing industry, Siena saw an opportunity to utilize a blockchain-based platform to connect and consolidate information with regards to aviation assets and data sharing. The decentralized nature ensures that information logged cannot be altered or revisited, relieving pressure on the engineering teams while ensuring that passenger planes get the attention they need. Having all members of the supply chain on the network means that everyone has access to complete histories, creating a level of transparency that is simply incapable of existing outside a digital network. Another positive effect of consolidating records is that it has the potential to create opportunities for private repair contactors — like a doctor making house calls. If an airline needs something relatively simple fixed in a short period of time, they have the ability to access a vehicle's 'complete medical history' and make informed decisions. Blockchain technology and its implementation are still in their infancy, and these early players spend a lot of time educating companies and individuals about the tools they're building and how they can improve efficiency within an industry. "Many successful startups are comprised of people with various [career backgrounds] who can go to other sectors and provide real solutions to real problems. Whereas, a group of tech guys might struggle to explain how blockchain can help grow other businesses," Siena furthers. In China, for instance, there are more and more of those forward-thinking entrepreneurs who see the value of security and transparency that comes with blockchain applications, and that seems to be one direction in which industries are headed. Cover image design via Hellorf. In our "Welcome to Jurassic China" series, part of our March 2019 cover story, we transport you to a lost world, a primeval China that existed before the dawn of man. A chance discovery in Jiangxi province in 2010 added a new member to the Tyrannosaur family. We take a look at the origins and customs of China's 'sanba,' aka International Women's Day. The Beijing-based artist is famous for his enthralling paintings and sculptures of dinosaurs, extinct mammals and other long-gone lifeforms. The 98-year-old author-artist celebrates the memories of his late wife with pictures and words. British photographer Cameron Hack interviews the last ladies with bound feet, ethnic minority groups and war survivors. Dating back to the 10th century, the peculiar Chinese tradition of foot-binding was a common practice among young girls in China.